A reader recently wrote in with a question about door jumpers. I bought the Graco Jumpster. 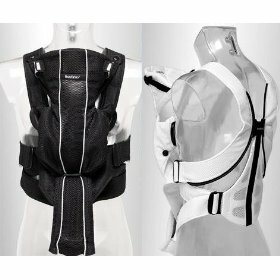 It got great reviews from people on the internet and the moms I know personally. 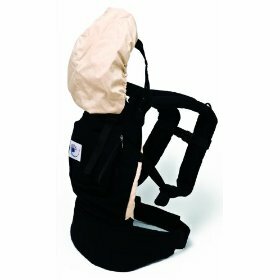 The jumper has three cords attached to the seat, making it very easy to get the baby in and out. It also has a mechanism that prevents these chords from twisting. The tray on the Graco jumper helps prevent the baby from hitting their head on the edge of the doorway when he gets extra excited. I found the Sassy Seat Doorway Jumper more pleasing aesthetically, but many of the reviews I read, mentioned that the way the ropes attached to the seat made it difficult to place the baby in and out, and the ropes would twist when the baby turned in place. Many moms I talk to, have the Graco jumper and love it. My son, who is now almost 7 months old, has never really taken to it. He would seem happy for a couple of minutes, but would quickly get bored, even with toys attached. He seems to prefer being on the floor. I never thought that I would want to “sleep train” my child. By 5 months our son was going to bed at 8pm, waking up around 11:00pm for a feeding and then sleeping until 5:00am. Although he only fell asleep eating, I thought this was reasonable. He was sleeping in a crib in our room and at 5:00am I would take him into our bed for the early morning feeding. Everything changed when we took a one week vacation to Canada. At the hotel, our son slept in our bed, and was able to have the breast on demand throughout the night, whether for food or comfort. Once we returned home, he did not want to be in his crib, woke up every hour at night, and screamed at the top of his lungs whenever I tried to put him back down. Eventually, after a few hours, I would get too exhausted and take him into our bed, so we could all get some rest. This lasted for a week with no improvement. I felt tired, irritable, and decided that something had to change. I did some research on the internet about various methods of sleep training. I spoke to my son’s pediatrician, who suggested we go “cold turkey”. He said “feed him, put him down in his crib, and don’t go to him until 7:00am. You will have three tough nights, and then he will sleep through the night.” I felt that this was too aggressive and because he sleeps in our room, this would be difficult to carry out. So, in my search, I saw an interesting review for Dr. Ferber’s book, so I decided to see what it’s all about. The book is called “Solve your child’s sleep problems” by Richard Ferber, M.D. I recommend reading the book before actually performing any intervention. In the book, he gives the reader an understanding of what happens during different phases of sleep and how the patterns develop. He talks about normal patterns of deep and light sleep and says that we all have brief periods when we wake up and then return to sleep throughout the night, without remembering it in the morning. The book then identifies various common types of “sleep issues” for kids of different ages. Ours for example was associations with falling asleep. Our son associated the breast or bottle as something he needed to fall asleep, even if he was not hungry. After helping the reader establish a “diagnosis”, Dr. Ferber then offers ways of treating the problem. The book is not preachy, and he does not advocate for the “cold turkey” method. In our case, the thing to do was to put our son down tired but awake, let him cry for 3 minutes, then go in and check on him/ talk to him (without picking him up), then 5 minutes, then 10. The first night he cried for a total of 20 minutes and then slept for 10 hours. He did not cry at night. If the baby does wake up at night, Dr. Ferber recommends following the same procedure as above (3, 5, 10). With each night, the intervals are supposed to get longer. Dr. Ferber states that it typically takes three nights, but may take up to two weeks. For the first week, our son would cry for 15-30 minutes at the start of the night and then would sleep for 9.5-10.5 hours. With each day the crying was less intense. In the second week, he would cry for 2-8 minutes. Now it has been about a month. At night, we bathe our son, feed him, and then I usually burp him, sing a song and put him down. He rolls over onto his tummy, without crying, and sleeps from 7:30-8:00pm until 6:00-7:00am. How do moms ever get things done? When you start a new job, you usually get some sort of training and there is a period of adjustment where you learn all the small things before you can take on responsibilities fully and complete projects independently. In the first weeks of coming home with a newborn, I felt like it was much tougher than any job I’ve ever had, there was no training period, I was expected to know how to do something that I had never done before, and I was suddenly working 24 hours a day with very limited sleep of 1-2 hour intervals. I had suddenly gained a new appreciation and respect for anyone who is a parent. My son is now six months old but I have been thinking about this because I spoke to a friend who recently gave birth and she mentioned that she was having a hard time getting out of the house at appointed times. I knew the exact feeling. My advice for the first few weeks is: don’t try to get too much done. Make one goal for the day, keep it simple, for example, “Today, I will buy some soap”. Don’t plan on getting out at a specific time, just plan on getting out of the house at some point and getting one small thing done. This way, you will not add unnecessary pressure on yourself, and will feel good because you will have set a goal and accomplished it. And if you could not get to it today, then there’s always tomorrow. When registering for crib bedding, I looked for something that was made of 100% cotton and had an attractive design. 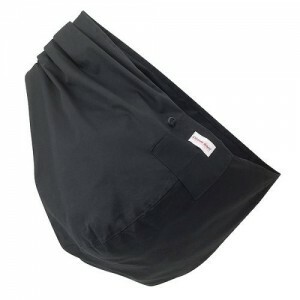 I found that most places sold crib bedding sets that cost $200 and more and often included items that I knew I would not use, such as a diaper stacker. Luckily, I came across Pottery Barn Kids. Their bedding was really cute, made of cotton, and each piece was sold separately, rather than a 4-6 item package. 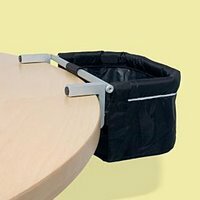 This allowed me to pick and choose pieces that I wanted, and created several less expensive options on the gift registry. When we came home from the hospital with our newborn son, my husband and I felt very excited and more than a bit overwhelmed. We found that at times we were at a loss of what to do when he cried. We would of course check that his diaper was fresh, he had been fed, did not wish to sleep, did not have a burp, and didn’t have a hair wrapped around his finger or toe. When holding, rocking, singing, swaddling, and all our other tricks didn’t seem to work, the one thing that we found extremely helpful during those first weeks was music. We used our iPhones to provide music wherever in the apartment we happened to be. A small music player with speakers will do the same job. Not all music helped to soothe our little guy, but I must say, the Rockabye Baby! Lullaby Renditions of the Beatles, was FANTASTIC! This CD features reworked Beatles songs without lyrics and involves some sort of chimes that just seemed to put him in a trance. It was amazing to see how he would stop crying and just listen. 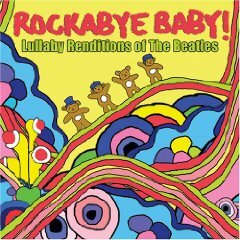 The Rockabye Baby series offers reworked versions of music of multiple artists. I also purchased the ones by Coldplay and Bob Marley, but these did not seem to have the same effect. Our son also responded to the Simon and Garfunkel CD’s such as The Best of Simon and Garfunkel and Negotiations and Love Songs as well as classical music, but nothing was like the Rockabye Baby Beatles. In addition to music, the other super effective calming sound was the blow dryer. Whenever he cried during diaper changes we would just turn it on and he would instantly calm down.